Should You LTL Your Trade Show Freight? Make sure you get your trade show freight to its destination on time with help from AFP Expo Logistics! When it comes time to plan out the logistics necessary for a trade show, one question that every company invariably asks is whether to go with a Less-than-Truckload (LTL) shipping provider or not for their exhibit freight. LTL carriers such as UPS Freight, YRC, and ABF will frequently point out their ability to handle trade show freight. These carriers are household names and transport the majority of freight in the United States, but they may not be the best choice for your trade show freight. Here’s why. When you need to have freight shipped from dock to dock and you aren’t operating under any time constraints, LTL carriers are ideal to turn to. Freight space is shared on the truck, so your goods will be heading to multiple locations before arriving at its final destination. But this is not a good option when you need to have your trade show exhibit freight shipped. 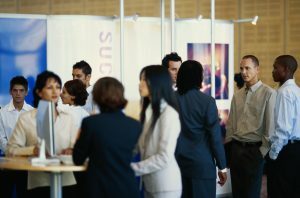 Trade show logistics need to operate on a strict timeline and be handled with care. So if LTL is out of the question, what should you do to make sure your trade show freight arrives on time? Trade show and event coordinators have turned to AFP Expo Logistics time and again because of our understanding of the time and handling-sensitive nature of exhibit freight. Our performance numbers speak for themselves. We exceed industry standards in on-time percentage (99.4%) as well as claims ratios (less than 0.2%) as compared to LTL carriers. Your exhibit freight needs to arrive at its destination on time and in the same condition as it was when it left your facility. Otherwise, your overall trade show ROI will be negatively impacted by the added costs that will result. Don’t gamble with your time-critical freight! Contact AFP Expo Logistics today! This entry was posted on Friday, May 5th, 2017	at 10:45 am	and is filed under AFP Expo	. You can follow any responses to this entry through the RSS 2.0	feed. Both comments and pings are currently closed.